Doors/Dinner 6 p.m. | Show 7:30 p.m. If it’s a Presidential election year, it must be the Capitol Steps. Pennsylvania Avenue meets Broadway in a satirical revue set to the music of classic pop hits and show tunes. 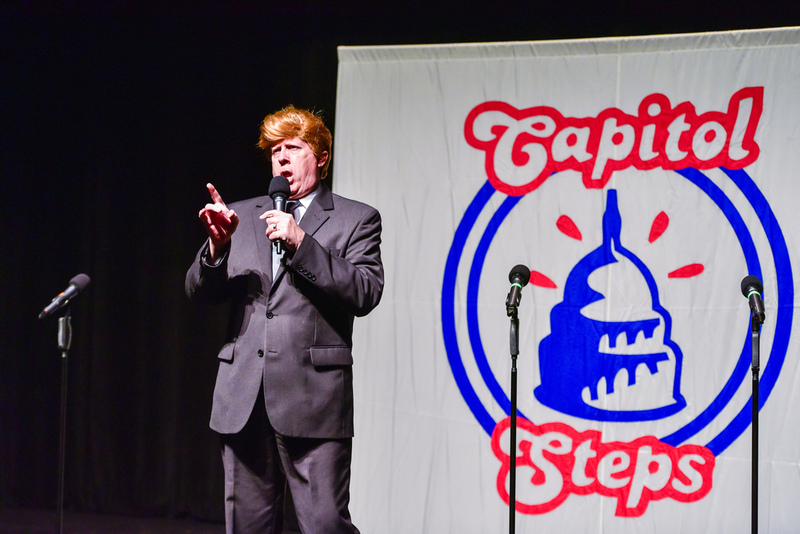 The Capitol Steps poke fun at all sides and are the one thing to earn bipartisan support. Watch them take the governing class to task with wit and glee. The group was born in December 1981 when some staffers for Senator Charles Percy were planning entertainment for a Christmas party. Their first idea was to stage a nativity play, but in the whole Congress they couldn't find three wise men. In the years that followed, many of the Steps ignored the conventional wisdom ("Don't quit your day job! "), and although not all of the current members of the Steps are former Capitol Hill staffers, taken together the performers have worked in a total of eighteen Congressional offices and represent 62 years of collective House and Senate staff experience. Since they began, the Capitol Steps have recorded over 30 albums, including their latest, What to Expect When You're Electing. They've been featured on NBC, CBS, ABC, and PBS, and can be heard twice a year on National Public Radio stations nationwide during their Politics Takes a Holiday radio specials. Smokey Cajun style Andouille Sausage, Caramelized Onions, Roasted Bell Peppers, and Crispy Bacon tossed in a savory Garlic Cream Sauce with Fettuccini noodles and Aged Romano Cheese.